Straight from the mouths of Keanu Reeves and Alex Winter, the long dreamt of third entry in their cult classic series will be a summer release next year. And even better, the film’s name is confirmed as well: Bill and Ted Face The Music! Taking place in the modern day, with middle-aged Bill and Ted still playing best buds who are waiting for their big break, this third adventure has the fate of the world in the balance yet again. This time, the only thing between the future of the universe and total destruction is a song. A song that Bill and Ted will need to provide. Directed by Galaxy Quest’s Dean Parisot, and written by Bill and Ted’s Excellent Adventure creators Chris Matheson and Ed Solomon, Bill and Ted Face The Music is currently shooting in New Orleans. Something that wouldn’t have happened, if it weren’t for the fans who wanted the Wyld Stallions to reunite for one more musical journey. Much like plenty of delayed sequels before it, Bill and Ted Face The Music has been talked about a lot over the past couple of years, but movement was always slow. Every time you turned around, it felt as if there was a new reason or a new cause behind why the third film wasn’t happening just yet. All the while, those involved kept proclaiming they did want to be a part of a third movie, the stars just needed to align for it to happen. We even got to a point last year where Keanu Reeves himself didn’t think this third film would happen. 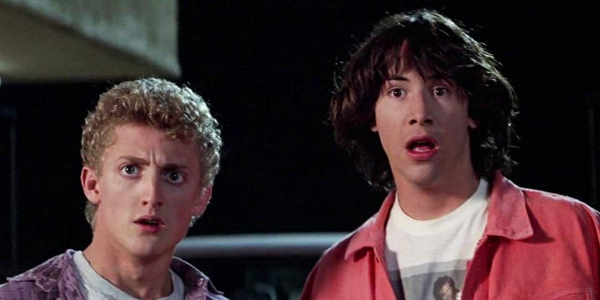 It’s almost been 30 years since Bill and Ted’s Bogus Journey first quenched the thirst for a sequel adventure pertaining to the well-being of William S. Preston, Esq and Theodore Logan. Now, the powers that be will finally give everyone a third riff of excitement that’s been decades in the making. Whether or not that trip to the U.K. that was previously rumored to be a part of this adventure, or even if how they got back from Mars will be explained has yet to be seen. There’s actually a movie where either of those possibilities can take place, because up until now it felt like Bill and Ted 3 was still a pipe dream. Bill and Ted Face The Music rocks out most excellently on August 21, 2020. It’s a heinous wait, to say the least, but the 2019 release schedule looks rosy enough that you could find some sweet action at the movies much sooner than you thought.